Since I live in England now, it seems only fitting to offer up a healthy version of fish and chips (although curry is the national dish here). I found this Weight Watchers recipe online. You don't have to be a member to access some of the recipes, so take some time to have a look. And for those who know me, I am sure you are not surprised as I get up on my soap box here. Please research the sustainability of your fish when thinking up meal plans. I checked out haddock and it gets the thumbs up! It would be best to skip cod. 1. Preheat oven to Gas Mark 6/200ºC/400ºF. Coat two large baking trays with cooking spray. 2. Place potatoes in a large bowl and add vinegar, salt and pepper; toss to coat. Arrange them on one prepared baking tray. 3. Transfer potatoes to oven and bake for 20 minutes. 3. Meanwhile, in a mixing bowl, combine 100g polenta, beaten egg, milk, zest, herbs and a little more salt and pepper; mix well to make a thick batter. 4. Dust fish with additional 2 tbsp polenta; add fish to batter and turn to coat both sides. 5. 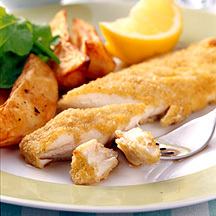 Place fish on second prepared baking tray and spoon over any remaining batter, patting over fish to make an even coating. 6. Transfer to oven to bake with potatoes for a further 18-20 minutes, until potatoes and fish are fork tender and polenta batter just starts to crack.